Did you know there is a difference between Yea-Sacc® 1026 and Brewer’s Yeast? All ‘yeast’ are not alike, and all brewer’s yeast (Saccharomyces cerevisiae) are not alike. Out of over 50 strains of Saccharomyces cerevisiae, very few have been scientifically shown to have the ability to stimulate growth of fiber-digesting bacteria. Yea-Sacc is one of the few and more importantly, Yea-Sacc 1026 is a live yeast culture, which has been found to give additional benefits to the digestive system. Dr. Pearse Lyons, founder and president of Alltech, developed this live preparation of a specific strain of brewer’s yeast over 35 years ago. It became known and trademarked as Yea-Sacc 1026. The Saccharomyces cerevisiae 1026 strain in Yea-Sacc 1026 was selected specifically for its ability to interact with gut flora. It has been scientifically tested, and was also re-approved in 2014 in the European community. “It is widely known that Europe has one of the strictest regulatory approval systems in the world for animal feed and food production. This approval confirms the Commission’s original recommendations. Yea-Sacc is backed with years of extensive scientific research conducted in collaboration with leading universities and research authorities here in Europe and around the world.” states Colm Moran. Below is a simplified table comparing the two types of yeast. Perhaps one of the greatest differences is the difference it can make for your horse. 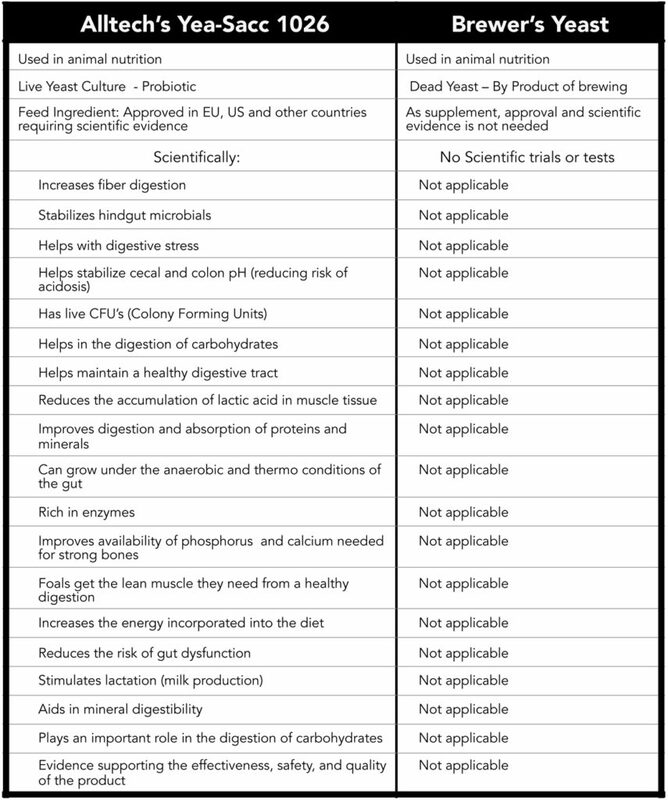 In summary, there are a number of yeast cultures available for equine diets, but Yea-Sacc has been scientifically proven to improve diets. It is also registered with the FDA, giving you confidence in it purity and quality. There is a difference, … which can be felt by your horse …. And seen by you!